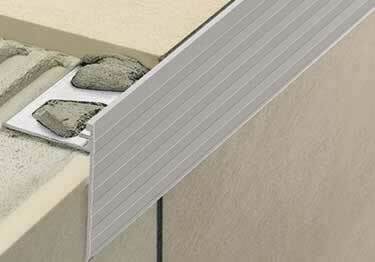 Schluter® SCHIENE-STEP finishing and edging profiles, corners, and connectors protect natural and ceramic tile edging on countertops, walls, and stairs. Ideal for residential use. SCHIENE-STEP is available in a smooth brushed stainless steel, or ribbed satin anodized aluminum and satin nickel aluminum. The SCHIENE-STEP line includes: Profiles, 90° Inside Corners, 135° Inside Corners, 90° Outside Corners with End Cap, and 135° Outside Corners, and Connectors. Heights: 1/4", 11/32", 5/16", 3/8", 7/16", 1/2", 9/16"
Heights:1/4", 11/32", 5/16", 3/8", 7/16", 1/2", 9/16"
Vertical Leg Lengths: 1-1/2", 1-3/16", 7/16"
Schluter® SCHIENE-STEP finishing and edging profiles, corners, and connectors protect natural and ceramic tile edging on countertops, walls, and stairs. Ideal for residential use. SCHIENE-STEP is available in a smooth brushed stainless steel, or ribbed satin anodized aluminum and satin nickel aluminum.